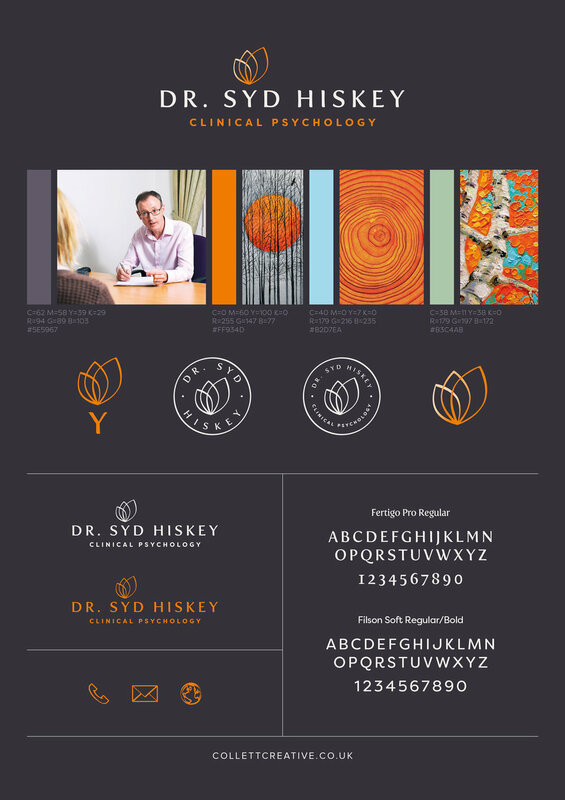 Recently we have been working on some identity design for Dr Syd Hiskey. Dr Hiskey wanted a new identity design to re-launch his practice in Colchester and asked Rachel and myself to assist him. We sat down with Syd and had a chat about his initial thoughts and ideas. During our meetings, we ask questions, took notes and began to form a design brief and list of requirements. Logo Design for Dr Syd Hiskey on Rubber Stamp. 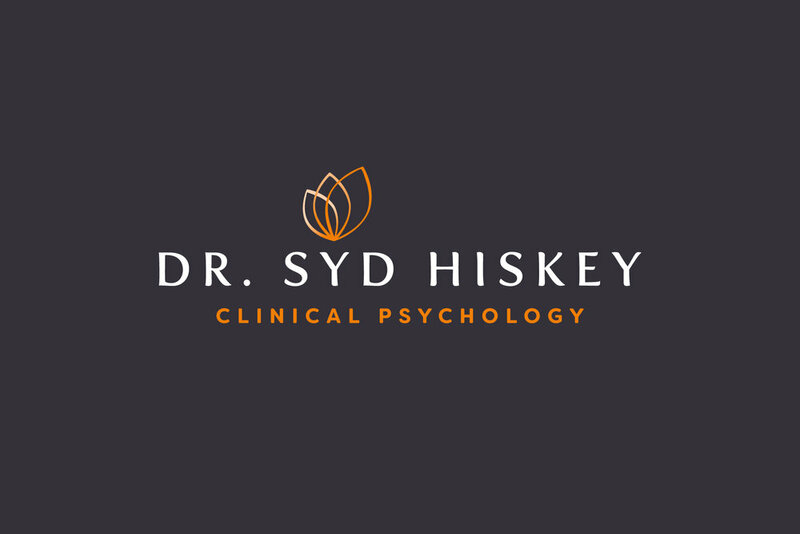 Logo Design for Dr Syd Hiskey. Secondary and Tertidary Logo Designs. We always create Mood Boards on every identity project we do, and we feel that client participation in this process is critical. Recently I wrote a blog post 'How to quickly create colour palettes for your brand' where I discussed how to make striking colour palettes for existing and new identities. That blog post featured some of the Mood Boards that we created for this project as examples. What I did not mention in that post is that we don't select the images in the mood boards ourselves. Instead, we ask our clients to choose them using Pinterest! This process is a vital step, as asking our clients to think about their identity visually gives us great insight into their thoughts, ideas and preferences towards particular styles and imagery. Along with a design brief, this information is useful when creating designs that will appeal to their target audience. To read this article in full, please click this link. 'How to quickly create colour palettes for your brand'. Dr Hiskey enjoyed selecting and choosing images for his Mood Board. We discovered so much about Dr Hiskey's visual preferences including a love of Asian and martial arts imagery. 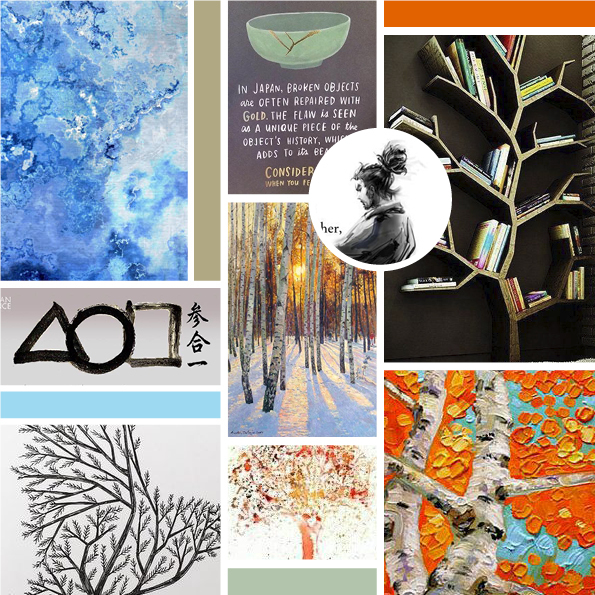 With Dr Hiskey's images and adding a few of our own based on Dr Hiskey's choices, we created the below mood boards to kick off the creative process. I always start off doodling and sketching out ideas in my sketchbook. I use this time to gather my thoughts and create some initial ideas before I begin any work at my computer. How many and now detailed these sketches are is dependent on the project I am working on. Sometimes they are just doodles, the sort you might do while talking on the phone but the process is essential as it allows me to find ideas and create visual cues that will help form various design directions for the project. Doodles and Sketches to gather my thoughts. We always aim to create 2-3 logo concepts for our clients. Dr Hiskey was keen to incorporate an Asian element within the logo designs. I knew I would need to do this sympathetically to avoid the ideas looking like logos for a Chinese restaurant of a martial arts training school. Dr Hiskey had mentioned a preference for orange and blue colours in our initial consultation, and it was clear from the mood boards that orange and blue tones would feature prominently in these designs. Below are the three logo concepts we presented to Dr Hiskey. We liked the suggestion of slight change that Logo No. 1 communicated and that idea worked very well with the kind of therapy that Dr Hiskey offers. Logo No. 2, the association with DNA appealed very much to Dr Hiskey. Logo No. 3, Dr Hiskey like the concept of balance and the goal to be emotionally centred using therapy portrayed by the movement in the petals/leaves. After some consideration and further development of these logos, we all decided upon Logo No. 3. We developed Logo No. 3 further creating a colour palette, secondary logo design, tertiary logo design and icons. With Logo No. 3 finalised and all its elements, we created a brand board. We always create a brand board for every identity project we work on as it gives a natural visual cue into the whole identity. For some identity projects, we create brand guides, but this depends on who and how many people will be using the identity within the business. As Dr Hiskey will be the only person using his identity at this time, it is not necessary to create a brand guide. Below is the completed brand board. With the brand board complete we moved on to designing business cards and letterheads. Dr Hiskey wanted a square business card with round corners, and we also agreed that this would fit nicely with the design. Letterhead and appointment cards design. Rachel and I visited The Oaks Hospital, Colchester and took some photos for Dr Hiskey for the new website. We are currently working on the new website and will have a link to it here soon. Here are some of the photos from the shoot with Dr Hiskey. Photograph of Dr Hiskey taken at The Oaks Hospital, Colchester for his new website. Rachel Photographing Dr Hiskey at The Oaks Hospital, Colchester. We always like to use the colours from a brand when we can for the background of any portrait photography we do. We shoot on a neutral background so that the colour can be altered and changed in post-production editing. 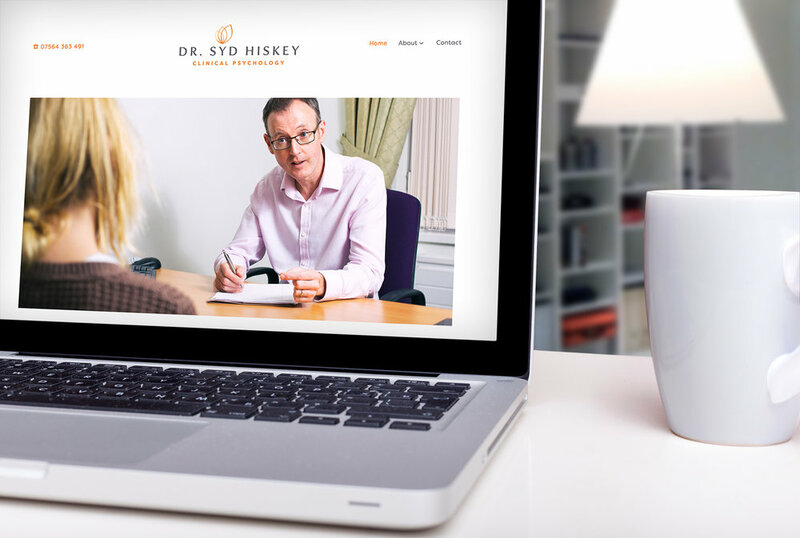 Website Design for Dr. Syd Hiskey. Homepage design as it was at launch of website. I have been very impressed with Collett Creative. Throughout the design and branding process, Mike and Rachel have been attentive, curious and most of all persistent in their search for a clear solution. The final result met all my needs and exceeded my expectations. I have always had an interest in design, and therefore it was a pleasure to find that elements of all the different components I was interested in were united in such an elegant way. Rachel was terrific in the way she that she managed the Photoshoot. Given the nature of my work, I was hoping for a clean and professional image that would inspire confidence and portray certain qualities. Mike and Rachel have helped me fully capture this within the new identity. We hope you enjoyed reading this post about the work we did for Dr Syd Hiskey. Thank you. Rachel and Mike will be in touch. Have some work you need doing? Don't want to run around to a separate photographer, designer and website developer to get it all done? Let us sort it all for you in one place. Newer PostProduct Packshot Photography for The Real Coffee Bean Co. This is where Rachel & Mike talk about the work they do and share their experiences. We hope you will enjoy reading about the projects we work on and the processes we undertake to create beautiful engaging design for our clients. Select a category of interest to find related blog posts. Type in keywords to find topics of interest. Find out about how we work and what we charge? A Facebook group we manage that gives help and support to Squarespace users of all levels and experience.